Wraps around hair 2 or 3 times. All seams overlocked, sewn and the elastic is sewn to last and not tied together. 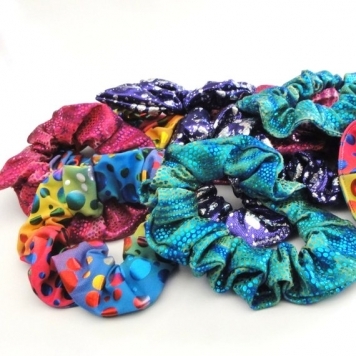 Sparkly Holographic Spandex Hairband Scrunchies made by UraMermaid. It will wrap around your hair 2 or 3 times.